Outrageous hats are a traditional feature of Royal Ascot but Cherish Finden, a judge on BBC2's Bake Off: Creme de la Creme, took things a step further on Tuesday by unveiling millinery macarons. The Coral-backed creation was inspired by the Queen's 65th anniversary and, in a baking nutshell, was composed of an edible rice-paper base dusted with a pearl sheen and topped with coral-coloured macarons filled with a blood-peach buttercream. 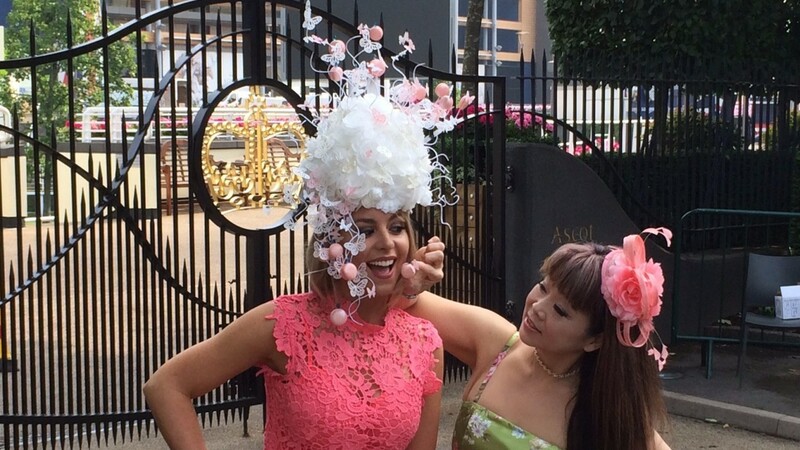 Finden, who stressed the almond-based macaron mix must never be overworked, fed Coral ambassador Carly Baker part of the hat at an 8.30am photocall, no doubt timed to ensure the headpiece did not melt in the sun. "It has been the most challenging project I've had," said Finden. "It took over 100 hours spread across six months. The hard part was working out how to make the hat sit properly on Carly's head. "Designing it was like solving a puzzle. All the time I also had to remind myself that this is for Royal Ascot, so the hat needed to be elegant and flamboyant, while at the same time good enough to eat." The diary can confirm it most certainly was good enough to eat. What do you do when you have two runners in a race but only one set of silks? You get another set made in two hours, of course. The Wesley Ward-trained pair of Elizabeth Darcy and Nootka Sound who ran in the Windsor Castle are owned by Hat Creek Racing, but only one set of colours made the journey over from America. Step forward Oxfordshire-based horsewear company Allertons, who managed to construct a new jacket in fittingly quick time given the connections involved. "We don't normally turn silks around in a day but we got a phone call at 9am and turned it around in a couple of hours," a spokeswoman for Allertons said. "We made the jacket as they managed to find another hat." There was no evidence of Middle East tensions on the Royal Ascot podium where Princess Haya of Jordan accepted the Queen Anne Stakes trophy on behalf of her husband and Dubai's ruler Sheikh Mohammed from David Redvers, racing manager of Qatar Racing. Strewth. Good job Michelle Payne, who arrived in a striking Royal Ascot outfit, brought a change of clothes. The Melbourne Cup-winning jockey had to replace her riding breeches after the pair in which she tried to weigh out bore branding that had not been registered in Britain. Ribchester's groom Billy Hardy almost missed his big day at Royal Ascot, having received a ten-month prison sentence, suspended for two years, this month after admitting dangerous driving, taking a vehicle without consent, failure to stop for a police officer, driving while disqualified and driving without a licence. The judge told him: "You have got your whole life in front of you. You are doing your best to throw it all away. You are committing serious offences whilst behind the wheel of a car." Royal Ascot is a very different place without Frankie Dettori. The meeting is a memorable occasion for so many, but after the jockey announced a persistent arm injury had forced him to give up his rides, this week will be one he wants to forget. Things kicked off to an unfortunate start as Lady Aurelia posted an unforgettable performance in Tuesday’s King’s Stand Stakes, and matters only got worse on Thursday when he missed out on a second Group 1 with Big Orange in the Gold Cup. Ribblesdale winner Coronet and Sandringham scorer Con Te Partiro would have been other big-race wins for the Italian, and the nightmares might not be over yet, as he misses out on numerous high-profiled rides on Friday, including Dabyah in the Coronation Stakes and Bound For Nowhere in the Commonwealth Cup.